Sunflower Days in aid of North West Hospice take place from June 9-11. Sunflowers pins and Sunflower plants will be available to buy from North West Hospice Volunteers throughout the North West and the public’s support would be greatly appreciated. Sunflower Days is a major national fundraising event for hospices throughout Ireland. 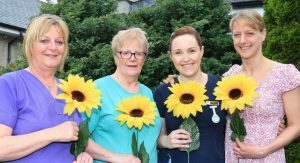 While the event takes place on a national scale, all Sunflower Days’ activities in Sligo, Leitrim and South Donegal are organised by North West Hospice and the organisation’s team of volunteers and supporters. This means that every euro raised in this region for Sunflower Days goes directly towards maintaining the North West Hospice service. This is a major, annual fundraising event for North West Hospice. It costs €2 million per year to provide the current Hospice Service and €1 million of this must come from fundraising activity and donations. The amazing support that North West Hospice receives from the community has ensured that the Hospice, now in its 30th year, has grown from strength to strength. Loughan House has kindly partnered with NWH again this year and hence we will have their wonderful sunflower plants for sale throughout the region as well as sunflower pins. “North West Hospice is extremely lucky to have incredible volunteers all around the North West region who are giving their time to help out with Sunflower Days,” said Cathryn O’Leary, Community Relations Officer with the Hospice. “It is thanks to them we’ll have sunflowers available throughout the North West this year, for sale in place including Sligo town, Ballymote, Tubbercurry, Enniscrone, Gurteen, Ballisodare, Collooney and Castlebaldwin to name but a few. “If you would like to bring our Sunflowers campaign to your area or would like to help out with our Sunflower Days, you can contact North West Hospice on 071-9170523 or fundraise@northwesthospice.ie” she added.